The gold standard treatment of spider veins is direct vision sclerotherapy, also known as standard sclerotherapy or microsclerotherapy. Direct vision sclerotherapy involves the injection of a special solution through a tiny needle into the spider veins, which causes them to collapse and eventually harden over. This hardening process is also known as sclerosis. Once the veins have hardened over, the body will gradually absorb them over the coming weeks to months. 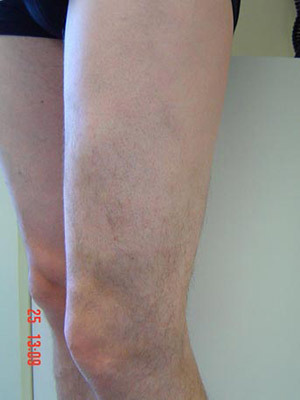 During a session of direct vision sclerotherapy, multiple veins are injected. While this may sound uncomfortable, most patients report very little pain or discomfort. Occasionally some of the injections may feel like a mosquito bite and patients might report a stinging sensation for a minute or so. 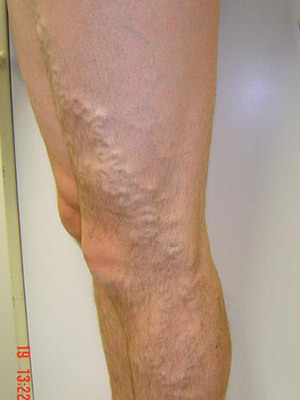 Commonly, patients with spider veins may also have underlying saphenous vein reflux (a large hidden varicose vein in the thigh or leg that is feeding the group of spider veins). 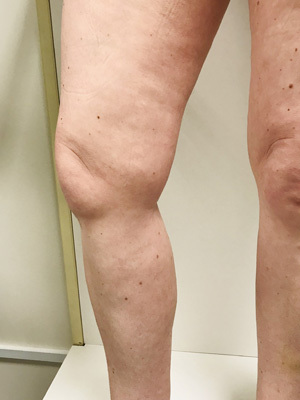 In this scenario, the underlying hidden varicose vein(s) must be treated first with either ultrasound guided sclerotherapy or endovenous laser ablation. All patients with spider veins are assessed at an initial consultation, and where appropriate a duplex ultrasound examination is performed to identify any underlying abnormal feeding veins. 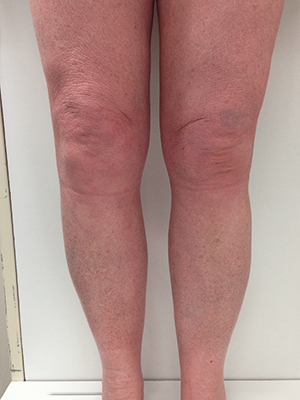 If there are no underlying veins, the patient will progress to direct vision sclerotherapy. For most patients with spider veins, the surrounding larger blue veins called reticular veins are treated first. Reticular veins are surface feeders. 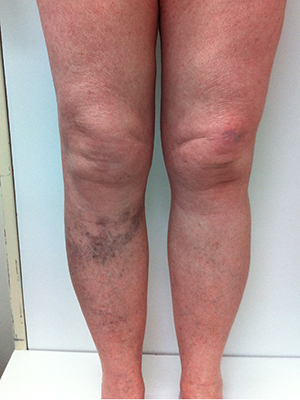 Six weeks later, the spider veins can be treated. 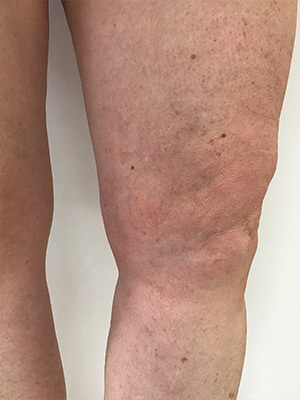 If there are underlying larger veins feeding the spider veins these must be treated first, with either ultrasound guided sclerotherapy or in the case of incompetent saphenous veins, with endovenous laser ablation. Following each treatment session, patients are required to wear a compression stocking for three to five days depending on the size of the spider veins being treated. The stocking makes the limbs more comfortable and reduces the chance of pigmentation and deep vein thrombosis. Treatment should be avoided if you intend to travel overseas within 3 weeks of your treatment. Patients who smoke should consider stopping before any treatment. Patients who are on the oral contraceptive pill or HRT will generally be instructed to stop this medication prior to treatment. However, if this is not possible, Dr Paraskevas may prescribe a clot preventer that will help minimise the slightly increased risks of deep vein thrombosis in patients who are taking these medications and who have direct vision sclerotherapy. What happens during Direct Vision Sclerotherapy? Many people are extremely anxious about needles, usually as they have had a bad experience in the past. Patients are reassured that the finest needles available are used for the treatment. Despite this, some patients will feel some slight scratches or pin pricks during the procedure. This can be followed with some mild stinging in some areas. This usually settles down within seconds. Dr Paraskevas is extremely empathetic and will slow down the procedure if there is any ongoing discomfort. This will not alter the treatment outcome or long term results. The patient’s comfort is of paramount importance. There are 2 types of liquid sclerosant available for use in Australia – STS and Polidocanol. We will use Polidocanol (which is packaged under the name Aethoxysklerol) for reticular veins and spider veins. We have observed less inflammation and more uniform results when using this particular sclerosant for direct vision sclerotherapy. This is the standard in most specialised phlebology practices in Australia. What should you do after Direct Vision Sclerotherapy? You will be directed to go for an immediate 20-30 minute walk before you drive home. Following this, the stockings should be worn for a total of 7 to 10 days but only during the day. They can be removed for showering or when going to sleep at night. Avoid long and excessively warm showers for 2 weeks. Avoid baths for 2 weeks. This will help facilitate the healing process. Maintain normal daytime activities but avoid standing still for long periods of time. Continue with normal exercise activities. When sitting, elevate your legs. What are some of the symptoms you can expect following Direct Vision Sclerotherapy? Below is a list of things to expect and are considered a normal part of the healing process. Mild Discomfort. Patients may develop discomfort in the areas that have been treated. This may occur on the first day or may occur days or weeks later. It represents the hardening process occurring in the treated veins and the body’s mechanism of dealing with the dead vein. Discomfort is usually improved by walking or by taking Paracetamol or Ibuprofen. Soreness behind the knee can result from rubbing by the stocking. Soreness in the heel of the foot or in the toes indicates that the stocking is way too tight around the foot or ankle region. Darkening of Spider Veins. 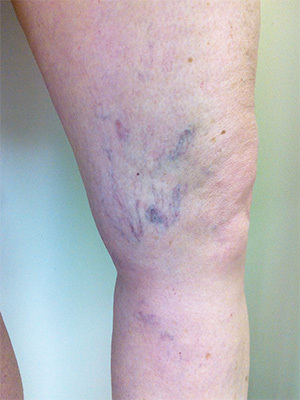 Treated spider veins will appear as darkened threads. They do not blanch with pressure and are representative of successful sclerotherapy. They will gradually fade with time. Bruising. Bruising usually disappears within 2-3 weeks and is not a cause of concern. Tender lumps. These are common in the treated veins and persist for the first few months. The lumps represent hardened or sclerosed veins – the precise intention of sclerotherapy. They will gradually reduce in size and eventually disappear. Sometimes, these lumps may contain trapped blood which is blood that has remained trapped within the hardened vein during the treatment. Trapped blood can be gently drained by tiny pin pricks several weeks or months after the procedure. Pigmentation. Haemosiderin or Iron deposits from trapped blood blood can be deposited in the skin along the treated veins. This is more frequent with large surface veins but can occur with spider veins. Most disappear within 12 months but less than 5% can persist beyond 12 months. 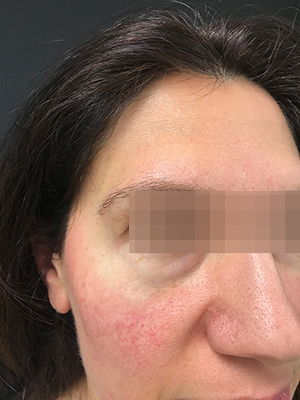 Persistent pigmentation may respond to laser treatment. 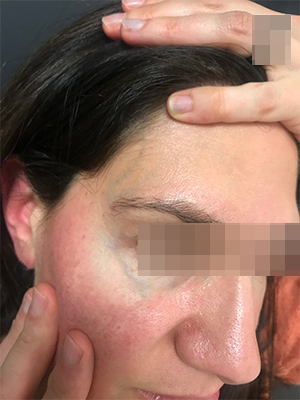 Pigmentation may appear as light brown discolouration or as a dark shadow along the treated vein. Matting. This consists of networks of fine dilated capillaries near the injection sites. It appears shortly after treatment in approximately 10% of patients. Most resolve spontaneously. If there is Persistent Matting, there may be a vein that has not closed during the treatment. Meticulous ultrasound examination is extremely important right from the get to, to avoid areas of persistent matting. Phlebitis. 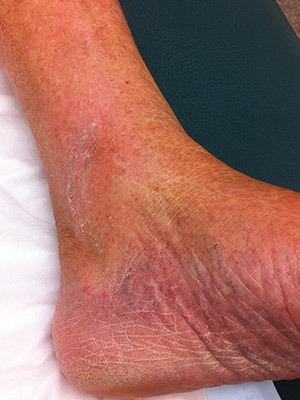 Inflammation of the treated veins can occur during the healing process. It will appear as redness and tenderness over the hardened veins. Phlebitis must be reported to Dr Paraskevas but it is not serious and can be treated with oral Ibuprofen (Nurofen) and wearing the class 2 compression stockings. What are the possible complications from Direct Vision Sclerotherapy? Complications can occur even with the best possible technique and attention to detail. Deep vein thrombosis (DVT). Clots are a recognized complication of many procedures but are very rare with direct vision sclerotherapy if the protocol of compression and regular daily walking is followed. It is optional to stop hormone preparations (oral contraceptive or HRT) as they may increase the risk of DVT. Allergic reaction. This is rare but may present immediately as an anaphylactic reaction with generalised rash, constriction in the throat or difficulty with breathing. This is immediately treated by injecting cortisone or adrenaline. Allergy may cause a skin rash after treatment requiring antihistamines. Allergy is slightly more common in asthmatics. Patients must stay in the building for 10 minutes after any form of treatment to ensure that no allergic reactions occur. Skin ulceration. 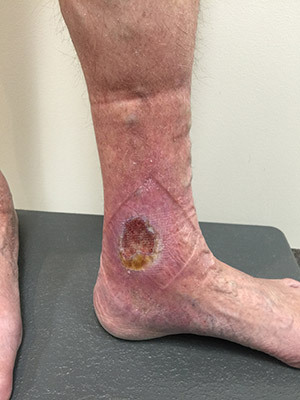 Skin Ulceration otherwise referred to as a treatment ulcer, is extremely uncommon. 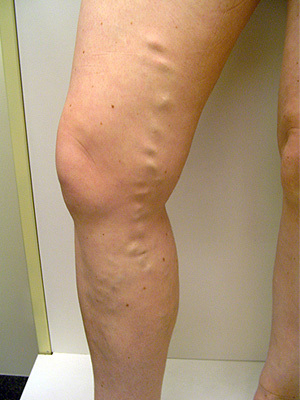 It occurs mainly because of an abnormal connection between small spider veins and arteries. Most injection ulcers are small and will heal without any scarring, particularly if they are recognized early and dressed judiciously with a Duoderm dressing. Very rarely do they heal up and leave a tiny pale scar.